From a European viewpoint the Anglo-Norman invasion of Ireland was seen as part of a wider movement of Western Europe colonial expansion. The invasion, conquest and settlement was part of a general expansion and colonization extending from the core areas of western Europe to the European periphery, which by that time included Ireland. A vibrant feudal, socio-economic system was at the heart of this development. Most English historians would agree, according to H.P Wolstencroft in his book “Our Historical Heritage”, ‘was in the long run a good thing for England. They believed that Anglo-Saxon civilization was not progressing, that it was too separated from more vigorous and progressive life of the Continent, the Normans were much cleverer people at governing and that they imposed a unity on the whole country which the Anglo-Saxons, with their local jealousies, would never have attained ……In fact, the Normans seem to have inherited or absorbed that genius for government which we have seen was such a marked characteristic of the old Romans’. ‘Moreover, above all other peoples they always practice treachery. When they give their word to anyone, they do not keep it. They do not blush or fear to violate every day the bond of their pledge and oath given to others – although they are very keen that it should be observed with regard to themselves. When you have employed every safeguard and used every precaution for your own safety and security both, by means of oaths and hostages, and friendship firmly cemented, and kinds of benefits conferred, then you must especially be on your guard, because then especially their malice seeks a chance. For they feel that because of your reliance on your safeguards you are not on the watch. Then at last they resort to the arts of evil and their accustomed weapons of deceit, so that, taking an opportunity of your feeling of security, they may be able to injure you when you do not expect it. Such ideas could be deployed to the advantage in the process of conquest and colonization. Thus the characterization of the invasion and conquest of Ireland: ‘as the struggle of “civilization” with “barbarism” —- was immensely satisfying to advocates of dominant life-style, who thereby assured themselves of their own superiority and of the desirability of the conquest or conversion of their rivals’. Gerald’s writings according to F. X Martin reflect the militaristic, entrepreneurial attitudes of the class to which they belonged to – the feudal military aristocracy – and the disparaging, dismissive, even racist attitude to the Irish to be found in contemporary England in particular. By 1350 the Anglo-Norman influence was most clearly stamped on the Irish landscape. Initially the lightly-equipped Irish soldiers could offer no resistance to the heavily-armed and well-drilled invaders, who cut through the country smelling out the better lands like well-trained truffle-hounds. The Anglo- Normans were prepared to expend capital on the organization of their manorial. The Fitzgeralds, the Butlers and the Burkes consistently searched for soils to their taste, or a strategic point worth defending; they erected an earthen mote, later replaced by a castle in places of special importance. Only the Burke advanced beyond the Shannon-river. They confined themselves mainly to Leinster and East Munster, which were to prove a centre from which Irish forces would frequently emerge to harass the farms and towns of the surrounding town-lands. The basic Anglo-Norman unit was the manor, extending perhaps to 3,000 acres and here the lord would have his home-farm or stead, often protected by a moat, containing his house and his farm-buildings, with its surrounding fields. Other large farm units would be given to supporters, linked to the lord by allegiance as well as rent, to rent-paying individual farmers, and to borough communities and burgesses, with land in common, and their own court and other privileges. The holders of these larger units came from outside Ireland. The population explosion in Western Europe and in England at the time, had brought about men anxious for tenancies of good arable land in return for payment of money in services and in kind. 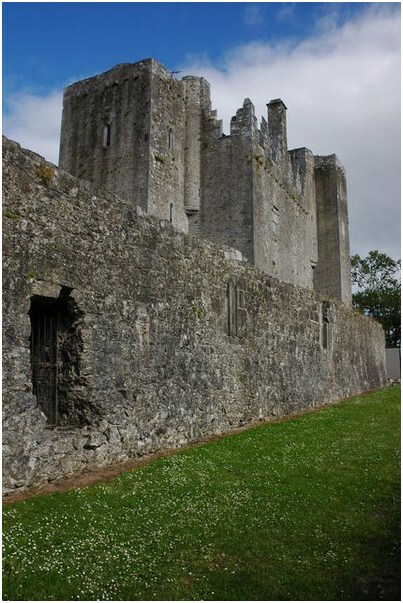 Barrymore Castle Philip de Barry – the elder brother of Giraldus Cambrensis (Gerald of Wales) was granted lands strategically placed in between Cork City and Youghal. By 1206, a charter of King John confirms the existence of Barryscourt manor at Carrigtwohill close to the medieval settelemnt of Cloyne. It contained approximately 10,000 acres of land.